Accelerate Baltimore ‘18 cohort member ClearMask has been busy these past few weeks not only with the AB program, but also as they recently won $25k from the Johns Hopkins Social Innovation Lab and $15k from Village Capital! Allysa Dittmar, ClearMask's co-founder and President, recently spoke to us about the mission of the ClearMask and its importance in the healthcare industry. Check out the story below! 1. Explain what ClearMask does. What's the mission of the company? We are making healthcare more human by developing the ClearMask, the first, full-face transparent surgical mask. The ClearMask can help reduce medical errors from miscommunication while increasing hospital disability compliance and both patient and provider satisfaction. The need for human connection in healthcare drives the ClearMask. Currently, standard and semi-transparent surgical masks block facial expressions, critical language markers, and other visual cues, creating a disconnect and increasing the risk of miscommunication. These masks especially pose a barrier for those who heavily depend on visual communication, including deaf and hard of hearing patients like me, children, older people, and those who may not speak the same language as their doctors. For everyone, the ability to see and express facial expressions helps improve understanding, reduce anxiety, and develop more human connections within healthcare and beyond. 3. Discuss your career/background prior to starting ClearMask. Why did you want to start a company of your own? I am a health communication and public policy professional with a specific focus on advancing public health and accessibility initiatives. As a recent politically-appointed policy manager at the Maryland Governor’s Office of the Deaf and Hard of Hearing, I worked on policy initiatives to improve healthcare and mental health access for deaf and hard of hearing patients. 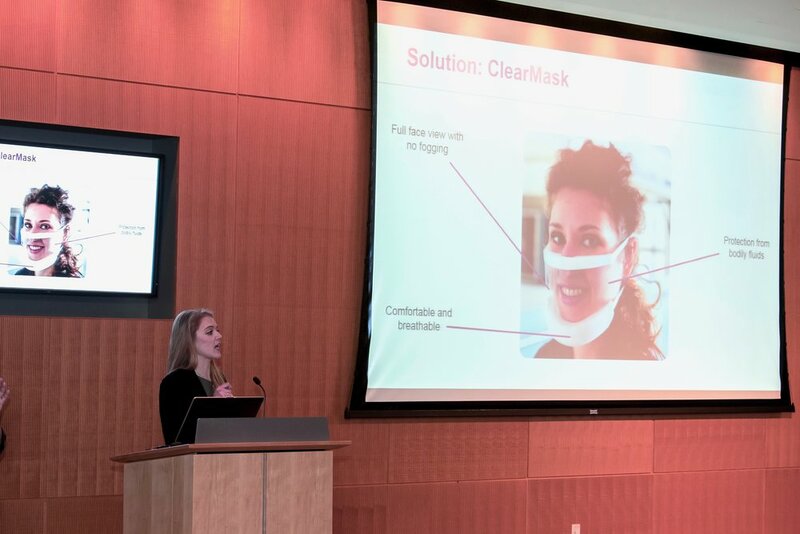 After having experienced an adverse surgical experience a few years ago, I co-founded the ClearMask to help improve communication, comfort, and connection in healthcare. My experience of being unable to fully communicate and connect with medical staff is very common; my team members and many others have also had negative experiences with standard surgical masks in healthcare. We believe it’s time to bring the human connection back in hospitals while ensuring optimal protection and safety. 80% of deaf individuals are either unemployed or underemployed due to pervasive societal barriers. Innovative startups and small businesses like ours are starting to become a significant source of the community’s economic engine and empowerment. 5. As a founder, how do you deal with stress and challenges? The hardest thing is to say “no.” It is important to be able to turn down opportunities to avoid burnout. For me, it helps to look at the company’s long term goals (as well as mine) so that I can say yes to opportunities that fit with my goals and values. I also build in opportunities in my daily schedule to try new things and enjoy my life. Don’t say “no” to everything! 6. Why do you like coming to work everyday? While I deeply believe in the ClearMask and its mission, my team makes the effort worth it. The passion, energy, and talent of this team is incredible! We’ve also focused on developing a safe, supportive, and accessible environment for our team members. 7. What have you learned from Accelerate Baltimore so far? How is the accelerator helping you? Mentorship is key! There’s so much you can learn from a mentor’s experience and insights rather than books and classes. 80% of CEOs receive some form of mentorship and 93% of startups believe that mentorship is instrumental to success. Accelerate Baltimore has been incredible with their mentorship program — we’ve been able to access seasoned mentors from virtually every field out there, including marketing, finance, operations, and sales. Our 2018 cohort is made up of some amazing companies. Join us on Wednesdays to learn about them! This week, we sat down with Dedrick Siddall of Fleet by MasT and Julie Polanowski of At Night Athletic to find out what their startups are all about. Check it out below! AB: In 5–8 words, what does your company do? Dedrick Siddall: MasT is a software development company. Fleet is our software — it helps members and organizations get the most out of each other. Julie Polanowski: LED illuminated athletic wear with safety distress alarm/alerts. AB: Why is now the time for your company to exist? DS: Our target audience are member-based organizations. Those organizations are broad — it could be a neighborhood association, PTA, health club, country club, The Kennedy Center. We work with both for profit, and nonprofits — any business that has members. Those businesses have a lot of tools to engage membership, and millions of software companies provide them with those tools. No one is bringing that software together — but that’s where we come in. Fleet is a mobile app that provides members and managers with everything they need in one place. It’s particularly helpful because we can help smaller companies that don’t have huge IT budgets. JP: Relatively recent LED light technology allows us to utilize a battery in ways that was not available in the past. This coupled with Bluetooth capabilities and growing self-awareness of people to live a healthy lifestyle shows that this is the time for us to exist. AB: If you weren’t building your startup, what would you be doing? DS: I would be running the IT shop at some big bank. I used to build platforms to help big banks and asset managers understand their data better. Now, I’m trying to translate that experience to help small nonprofits and businesses. JP: I would be growing my consulting business. I do various consulting on e-commerce software, branding, online presence and various marketing applications. AB: How do you measure success? DS: We go to work every day because we want to save the world from the belief that 80% of life is just showing up. If that were true, the phone in my pocket right now would be a Nokia. Success for us is helping our clients our clients do their job – every day – better than they did it yesterday. However they want to measure that. More revenue, more time to concentrate on their missions, more member involvement, better programming, whatever. When we do that, we all succeed. JP: When I see our product being used as I drive home at night, I will know that we are successful. AB: Where do you think your company will be next year? DS: Fleet will hopefully have reached a state of product maturity — it will have shifted from launch mode to growth mode. JP: Our company will be slowly growing. We don’t want to take on large amounts of debt, but we do want to use as much of our resources to provide as many people with our product as we can. AB: What have the first few weeks of Accelerate Baltimore taught you? DS: The latest lesson that has become apparent is that I need to get out from behind my desk. As the leader of a company that’s a few people and a bunch of contractors, I have to wear a lot of hats. I need to step out of developer role to a sales role. JP: We have to look beyond just business. We have to understand what makes us At Night Athletic, why we are doing what we do, and build on that. Sonavi Labs – A next generation smart stethoscope with on-board diagnostic capabilities that empowers community health workers and physicians alike by improving access to health care in non-traditional clinical environments and by allowing for home and remote patient monitoring. “ETC and Accelerate Baltimore continue to resonate and have an impact on Baltimore; the quality of this year’s applicants was striking and as a result, the Abell Foundation was generous enough to allow us to increase the total to seven companies in Accelerate Baltimore’s seventh cohort”, said Deb Tillett, president of ETC. Each of the seven companies will be awarded $25,000 in seed funding and 13 weeks of programming provided by the ETC. AB aims to close the gap between innovative ideas and the ability to get to market quickly. In addition to the seed funding, these companies will receive access to over 16 mentors, ETC’s Incubate Baltimore program, weekly hands-on sessions with guest speakers and executive coaching from Leslie Woodward. The cohort will also have access to local investor readiness tool Pitch Creator, a course for entrepreneurs to learn and workshop how to create a pitch to investors. In addition, one AB company will be awarded an additional $100,000 following successful completion of the program. Last year, the additional funding was awarded to Chord, a smart collar that uses only positive reinforcement to keep pets safe within invisible fences, establish indoor boundaries and help train pets. Chord used the funding to finish the prototype, sign up its first pet trainers for testing, establish manufacturing partners and create a “puppy” version of the collar. A startup with local roots is getting a marketing and advertising boost from a class of Johns Hopkins University students. Jetpack Inc. was founded by entrepreneur Fatima Dicko, who also founded Baltimore subscription box delivery venture mybestbox. Dicko went through the Emerging Technology Centers' Accelerate Baltimore program and secured early funding for mybestbox in 2016, before traveling to Stanford University for graduate school. At Stanford, Dicko came up with a new delivery service. With Jetpack, designated university students act as delivery agents for certain "essentials" college students may need at any time. A student can order products like toothpaste or phone chargers through the Jetpack app, and a delivery "Jetpacker" brings the product immediately. Jetpack was launched on the Stanford campus last year, with goals of expanding to other campuses. And now, the startup is looking back to Baltimore for help with its expansion efforts. The startup is now a "client" for this year’s Advertising and Integrated Marketing Communications class at Hopkins. During the spring 2018 semester, the undergraduate class will serve as a full-service marketing agency called Hoptimize Advertising. It will research, develop and implement a marketing campaign for Jetpack, specifically for the Hopkins Homewood campus. The budget for the campaign will be $2,500, and the goal is to secure 1,000 app downloads and increase brand awareness to 80 percent among the school's undergraduates. Students will use surveys and in-depth interviews to gain market insights on the needs and behaviors of Hopkins students, then roll out their campaign based on a collaborative effort from several departments, including graphic design and finance. Spencer Abrohms, a junior at Hopkins and co-manager of Hoptimize’s research department, said he was excited about the hands-on learning experience this partnership will provide. A Baltimore startup, backed by over $140,000 in funding, is gearing up to test its prototype smart collar, that helps train and control pets without the need of a shock collar. Barttron Inc. has developed a tech-based pet collar called "Chord" that is designed to use a combination of vibrations, voice commands and positive reinforcement training to help owners train their pets and eliminate unwanted behaviors, even when the owners are not around. The startup has built on the combined knowledge of engineers and animal behaviorists to create its technology. "Basically, it's like you are with your dog 24 hours a day, always there to monitor behavior, even when you're at work for eight or nine hours," said CEO Jared Marmen, a computer and electrical engineer. "But it's not a shock collar. No one really wants to hurt their dog, so this uses a different kind of reinforcement to get rid of those unwanted behaviors, like climbing on furniture. " Barttron is now working Blue Line K-9, a dog training business in Aberdeen, to test its prototype collar. The tests will look at how dogs respond to the sound and vibration commands from the collar across several variables — including different ages and breeds of dogs, time of day and environment. The tests will be the next step in the commercialization process, as Barttron moves toward commercial sale of its collars in the fall. The company is named for Marmen and his wife's first dog, Bart. Marmen said he has put about $45,000 of his own money into the business so far. The startup recently received $25,000 in seed funding as part of Emerging Technology Centers' 2017 Accelerate Baltimore cohort. Barttron also won an extra $100,000 from the ETC, as the winner from its cohort pitch competition. Another $19,000 from Maryland Technology Development Corp. will be used to test and further develop Chord's technology. About $6,500 of the TEDCO funding will go directly to Blue Line K-9 to plan, conduct and report on the testing of the prototype collar, Marmen said. And $12,500 will be used by Barttron to fund the cost of materials and fabrication of the components of the collars. Barttron has three full-time employees and about 11 part-time employees. Marmen said he ultimately wants to grow the company as it proves out its technology and starts scaling up production. The startup is currently accepting online pre-order requests for Chord. The Chord technology is app-based and owners can program virtual boundaries and unwanted behaviors into the app. So if you don't want your dog on the couch, Chord will know that and alert your dog when he gets to close or give him a command using your recorded voice telling him to get down. "People always say things like 'I can't train my dog, my dog can't learn those things,' and we know that's not true," Marmen said. "Successful training is about having the right motivation. We think this can make the whole process easier for both the pets and their owners. They are working together to learn good and unwanted behaviors." Marmen said he started working on the idea for the Chord collar back in 2014. He had moved into a new home and wanted to let his dog run around outside, but he did not have a fence and didn't want to buy a shock collar either. The collars will start out as basic training assistance devices, but Marmen said he eventually hopes to build in features like virtual yard boundaries, which will keep dogs safe without the need for an electric fence. *This article originally appeared on the Baltimore Business Journal. View the article here. If you haven’t heard already, AB company Chord won $100,000 from the Abell Foundation at Investor Pitch Night last month. Chord also picked up recognition at Pitch Across Maryland’s finale, as well as FounderTrac’s demo day in Annapolis, according to Technical.ly. Chord’s founder, Jared Marmen, explained during his pitch that the additional funding will help the company move out of testing phases with the product—a smart collar and the app, which train pets through positive reinforcement with invisible leashes and fences. Reciprocare recently came out on top at the D.C. regional finals of InnovateHer 2017, and is on to the next round of InnovateHER, the annual national pitch competition organized by the Office of Women’s Business Ownership at the U.S. Small Business Administration. Along with completing the Accelerate Baltimore program, Reciprocare also completed the Aging 2.0 Baltimore accelerator, and won $5,000 at the A2B Demo Day. The startup is looking to launch its service, which will connects agencies with caregivers and help low-income women find jobs. Alex Bullington, CEO of Arbit, told the BBJ that the goal for the app was to connect fans to their favorite actors and athletes, and, at the same time, give brands the opportunity to get real-time feedback and data from their audience. Plus, he shared that Arbit’s user base has grown to include NBA star Dwyane Wade, and actor Mark Wahlberg. Eric Niu, founder and CEO of men’s clothing consignment app Swaggle, told Technical.ly that with Swaggle, there’s no need to browse. You can search for the item you’re looking for, and easily swipe through the options to make a choice. Once you’ve reached an agreed price for the item, you purchase it, then choose between mail delivery, an in-person handoff or pick up at a local consignment shop. Swaggle was also featured as one of the style apps that will change the way people buy clothes in Best Techie. Baltimore, MD (April 24, 2017) – ETC (Emerging Technology Centers), Baltimore City’s leading technology and innovation centers, announced the winner of the Accelerate Baltimore program’s additional funding of $100,000 was Baltimore based company Barttron with its product Chord. Each year, Accelerate Baltimore (AB) awards six companies $25,000 each in seed funding and provides an intensive four-month program to help them move their businesses forward. This is the sixth year in which the ETC, in partnership with the Abell Foundation, has successfully run Accelerate Baltimore. To date, 34 companies including Allovue, MyBestBox and Loople, have graduated from the program raising a total of $11 million in follow on funding. Last year, after looking extensively at early stage funding trends in 2015, and the experiences in the past years of AB companies, ETC concluded that requesting additional funding from its Abell Foundation partners in the amount of $100,000 would enhance the probability that these companies would be successful. This is now the second year in a row that AB has awarded the additional funding. Barttron is developing Chord, a smart collar that gives dog owners a punishment-free electronic training and monitoring device to keep dogs safe, protect property, and eliminate unwanted behavior. The Chord collar solves the most common problems of dog owners: creating indoor and outdoor boundaries, providing no-harm behavior reinforcement, and eliminating excessive barking - without ever punishing or hurting the beloved pet. Barttron is raising a seed round closing in June to take the current Chord prototype to initial production. “The $100k investment by the Abell Foundation will allow us to move beyond our current ‘garage-based’ prototype manufacturing to the industrial processes we need to make high quality collars and be able to scale in the near-future” Says Jared Marmen, CEO of Barttron. Last night’s Investor Pitch Night ended AB’s 2017 program, where each of the six companies pitched the judging panel made up of local investors for a chance at the additional funding. The Accelerate Baltimore Investor Pitch Night was held at the Mt. Washington Dye House and Barttons’ Chord was the choice to receive the additional funding. The award was presented by ETC’s Deb Tillett, Baltimore Development Corporation’s (BDC) William Cole, and Abell Foundation’s Eileen O’Rourke. The ETC, a venture of the Baltimore Development Corporation, is a 501(c)(3) technology and innovation center focused on growing early-stage companies. The ETC provides four programs for entrepreneurs: a tech focused incubator, Incubate Baltimore, a seed accelerator program, Accelerate Baltimore, a coworking space open to innovative individuals and teams, Beehive Baltimore and a pre-accelerator program, Pioneer Baltimore. The ETC promotes economic development, providing business, technical, and networking connections to help these companies grow. Since 1999, the ETC has provided assistance to over 450 companies, 85% of which are still in business, creating more than 2,500 jobs and raising more than $2.4 Billion in outside funding. Everyone’s definition of success varies because we all have different goals. Here’s what two 2017 Accelerate Baltimore cohort members, Trevor Brooks of GunBail and Charlene Brown of Reciprocare, have to say about the concept of success. AB: Trevor, tell us a little bit about you as a person. Where did the idea for GunBail come from? GunBail: My name is Trevor Brooks. Well, gun violence is personal to me. I’m the product of the Inner City of Baltimore. I’ve been a ward of the state since I was 9 years old, so I’ve always self-taught to get by. As a teenager, I was convicted for a gun-related crime, and that basically changed my life. From that day on, I decided to do something to change the future of my community so that young people don't have to go through the same thing I did. I think local youth are misguided, or for that matter, unguided. I see it clearly- fewer guns means less crimes. Young people who are killing each other are doing that as a result of access to illegal guns. I just want to change the lives people who don't have the means to do it for themselves because society overlooks them. AB: So what does GunBail do? GunBail: We create a database of illegal guns, so we can track — and prevent — the future proliferation of those guns. Our goal is to decrease gun violence because that will lead to a decrease in homicides since over 95% of gun homicides are committed with illegal guns. I’m concentrating on making a positive impact. AB: Tell us about a time when you’ve maybe thought that you’ve failed. What were some lessons that you learned? GunBail: In the beginning, I had to knock on doors basically. I knew I had to target politicians, and it was very hard to get meetings with them. It’s been a challenging journey because I’ve had to deal with three very different systems: the courts, the streets, and politics. But my motivation is if I don’t continue with this, then illegal gun violence will never stop. There’s nothing else on the market like GunBail. It really is my purpose. I actually started out in New Jersey, but I got there during a time when they were changing their whole bail system, implementing a no cash bail system. We had difficulty there since we get illegal guns off the streets by exchanging those guns for bail for inmates in pretrial custody. I deflated after that and thought, am I doing the right thing? When I came to Baltimore, I was able to connect with Ray Lewis, and get his support. That helped create GunBail’s credibility. Now there are tons of people like him who are ambassadors for GunBail, and I think we’re really getting somewhere. AB: During your time in the Accelerate Baltimore program, what have you accomplished that you are most proud of? GunBail: Accelerate Baltimore has helped validate GunBail and it’s mission in the eyes of the local political structure. We’re now seen as a valuable startup. Plus, the ETC connected us to the Mayor’s office, and helped us gain exposure within various political circles. I’ve truly loved this experience. To learn more about GunBail, visit the website. AB: Who is Charlene Brown? Tell us a little bit about you as a person. Reciprocare: I’m from New York City, I’m married, and I’m a public health doctor with 15 years of public health programing experience both global and domestic. I’ve helped shape policy and design implementation, and I’ve been overseeing interventions to help improve condition of life for poor people. AB: Can you tell us more about your professional background? Reciprocare: The subjects I’ve worked with the most are HIV prevention and care, tuberculosis, and drug development — working to keep drug patients safe. I’ve also worked with chronic disease prevention and STDs. About 10 years ago, I created a public health consulting company which was my first attempt at entrepreneurship. There, I worked a lot on global HIV prevention and care. That strife of entrepreneurship was honestly accidental, but I guess that’s when the seed was planted. In 2012, I was taught ideas foundation of entrepreneurship and business, and that really shifted how I thought of my career. AB: Where did the idea for Reciprocare come from? What’s your inspiration? Reciprocare: My friend and mentor Marcus Scott was a nonprofit creator, and he was truly a serial entrepreneur. He believed he didn't know everything, but found people who did to help him carry out the various ideas he had. I was very much influenced by the way he exemplified how you can move from public service to entrepreneurship, and the way he proved how they can work together. After he passed away, I decided to pursue Reciprocare and the entrepreneurial spirit in me to honor his memory and what he taught me. AB: What does success mean to you? In other words, when will you be able to look back on your life and think that you’ve been successful? Reiprocare: My goal is to increase the capacity of the underemployed workforce to increase capacity of the industry to serve seniors. By eliminating underemployment in the workforce, we will enable nation to age with grace. I see Reciprocare truly having a social impact. To learn more about Reciprocare, check out their website. Reciprocare is in presales, looking for interested homecare agencies who want to grow their business by growing their workforce. If you are interested in working with Reciprocare, you can contact them at hello@reciprocare.co. For startups, making the most of every hour in the day is essential for success. At the heart of this journey is, of course, the startup’s founder, who has to take care of everything ranging from IT to marketing, in most cases. We’ve compiled a list of the most helpful productivity tips for founders to ensure that your 24 hours never go to waste. Is this task urgent or important? Urgent tasks need immediate attention, while important tasks could be completed in a couple of days without any harm to your business. Which of these tasks is the most valuable to your business? Which tasks require the most effort? If there are two tasks which are both urgent, a great way to figure out which one to complete first is to see how long each task will take. That way, you can complete the shorter task first. Critically thinking through every task that needs to be completed each day will keep you from falling behind. If you set strict deadlines for yourself with regards to each task, the likelihood of it being completed will increase significantly. With that being said, be realistic—don’t set yourself up to fail. If you know that a certain project will take you longer than you would like, give yourself more time complete it. Try to finish each task in the time you’ve allotted, but if it’s not possible, don’t pressure yourself. You should, at the end of the day, always produce the best work. As a founder, it’s your job to make sure that your vision for your startup is maintained throughout your journey. That doesn’t necessarily mean that you should be the only person maintaining it, though. The most successful startups are the ones that have a solid foundation: a strong team. Take some time finding people that you trust with your idea. Hire people that you see yourself getting along with, who bring different skills and can be an asset to your business. Then, when you have multiple tasks that need to be completed, assign them to members of your team based on their strengths and skills. By tracking what your startup is doing, not only will you have a list of accomplishments to motivate you on a rainy day, but you’ll also be able to assess which campaigns and methods worked well for you, and which ones you need to revisit to improve. Analyzing your efforts is the best way to grow as a business. Plus, when it’s time to meet with your investors, having a list of ways you’ve improved operations will be a commendable effort in their eyes. Just because you’ve finally started the company you’ve been dreaming about, doesn’t mean you have the funds necessary to help your startup grow. Even so, we’ve compiled a list of resources to help you build a following on social media, get press attention, build a great mobile app, or even find captivating stock photos! Thousands of high-quality design freebies. Using freebbble, you’ll find fonts, icons, mobile templates, and wallpapers — all for free. Just make sure you pay attention to the licenses attached to each design so you know when and how to use it. On the site, it says that if the license on a design is unknown, it’s usually because the user forgot to mention it. All you have to do is ask them nicely about their design, and they’ll probably let you use it! Looking for images to use in your campaigns and on your site that aren’t cheesy and are free of legal restriction? StockSnap holds thousands of beautiful photos that could be right for you! Make sure to also check out StockUp, TookAPic, Pexels, or Unsplash to find the perfect image. Free engagement and communications tools for mobile developers. Not only will Batch help your startup be smarter mobile developers, but it will also help you become better designers and marketers. It will help you optimize push notifications, target users more intelligently, and analyze data meaningfully. Get press coverage for your startup. Using Submit.co, arrange various media outlets by number of Twitter followers and Alexa rank to find the perfect source relating to your startup so they can help tell your story! Though you’ll still have to find specific journalists and contacts in most cases, this platform will help you figure out which publication you should reach out to. Creative and engaging images for social media, quick. Even if you’re not using Buffer to manage your startup’s social media, Pablo will help you create the perfect graphic to share on Instagram, Facebook, Twitter, and even Pinterest. Just find an image (or upload your own), and write up the information you want to share to your followers. You can also change the font, and even upload your startup’s logo! *Written with the help of ProductHunt. What’s the Job of a CEO? Last week, we spoke to two members of the 2017 Accelerate Baltimore cohort — Angel Rich, CEO of Wealthy Life, and Eric Niu, CEO of Swaggle — about how they started their companies, and what they do as CEOs. AB: Angel, tell us more about your background before you started WealthyLife. Angel: I was global market research analyst, and I come from a family of life insurance agents. Growing up, I was bothered by the fact that people couldn't manage their own money. I had this burning passion within me when I was young to become an inventor. I wanted to create a solution to this money management problem, so first I worked in research to learn more about the problem, and then I started WealthyLife. AB: What is WealthyLife for people who don’t know? Angel: It’s a way for people to get financial literacy through online games and testing. We were actually named the Best Learning Game by the Department of Education in December when we competed for 6 hours against other up and coming educational games. It was crazy — I almost fainted! But it’s one of my proudest moments. AB: What are some other recent accomplishments? Angel: We recently got a $3 million contract with the Department of Health & Human Services. We’re going to be working with people who are on probation so that instead of just picking up trash, they do something meaningful by downloading our game and being educated on finances. I was also invited to the Top 30 Women in Tech conference by Google in New York, and I won that pitch competition! AB: As the CEO, what’s your management style? Angel: I’m very detail oriented. With my team, I always try to find the balance between being nice and still being detail-oriented. What I mean is my attitude with everyone will always be positive, but I want to make sure that people are being productive and completing their tasks correctly. I’m currently trying to build my communication skills as a manager so I can help everyone be accountable for their actions. AB: What does your average day look like? Angel: At the moment, it’s hectic. As soon as I wake up, I’m back to work, answering emails. Then I like to create around 3-5 to-do lists, re-prioritizing throughout the day as necessary. And I have set the goal of having at least one or two big accomplishments per day to move my company forward. I always want to be working hard! I have a couple of meetings throughout the day, and towards the end of my day, I like to learn something. Sometimes I watch gamification talks on YouTube, and sometimes, I research on how to improve my company. I want us to be the best. To find out more about WealthyLife, visit their website, or follow them on social media. AB: Eric, tell us more about yourself. Eric: I’m the founder and CEO of Swaggle. I was born in China and raised in California, and I came to DC after college. I was one of the youngest political appointees in the Obama administration, and I worked there for two years innovating. I consulted with Deloitte for a while, and then I started Swaggle 2 years ago. I feel like my immigrant background really made entrepreneurship a part of my life, as well as fashion. It gave me grit. AB: Did your political background influence the creation of Swaggle? Eric: It did. I didn’t have much money to spend on clothes when I was working for the Obama Administration, let alone professional clothes, so I wanted to solve that problem. I realized at that time that the consignment shop industry is mostly for women, so I started trading clothes with my friends. Our goal with swaggle is to create a personalized shopping experience for men, and we want to save them time and money. AB: As a CEO, what inspires and motivates you? Eric: Matthew McConaughey said something that really resonates with me. He was asked who his hero is and he said, “It’s me in 10 years,” and I think similarly. I think of everything as a possibility. I do have some audacious goals, but I have them because I know I’ll figure out how to achieve them. I just surround myself with positive energy — that’s why I listen to so many Ted Talks and read so many books. AB: Do you have a particular management style yet? Eric: [Laughs] I think that’s an overstatement for startups. I think of it like we’re a team. We just hired a new intern, but I’ll never introduce her as our intern — she’s another member of the team. The thing is, you can never be the smartest, so you should aspire to surround yourself with smart people. I’m the type of person who wants to be collaborative and approachable, but I also enjoy setting ambitious timelines. AB: What’s in the works for Swaggle? Eric: We just got an amazing partnership with Reddz Trading — they’re a DC based consignment shop. I guess we have two goals right now: we want to make clothes swapping easier between customers, but we also want to make trading between brick and mortar stores and customers easier. We also had the idea of working with dry cleaners so when someone doesn’t claim their item in the period of time that the cleaners allow, we could take in those items. That way we can help create a new revenue stream for the dry cleaners too. Swaggle is launching in Spring 2017. Check them out on their website, and on social media.